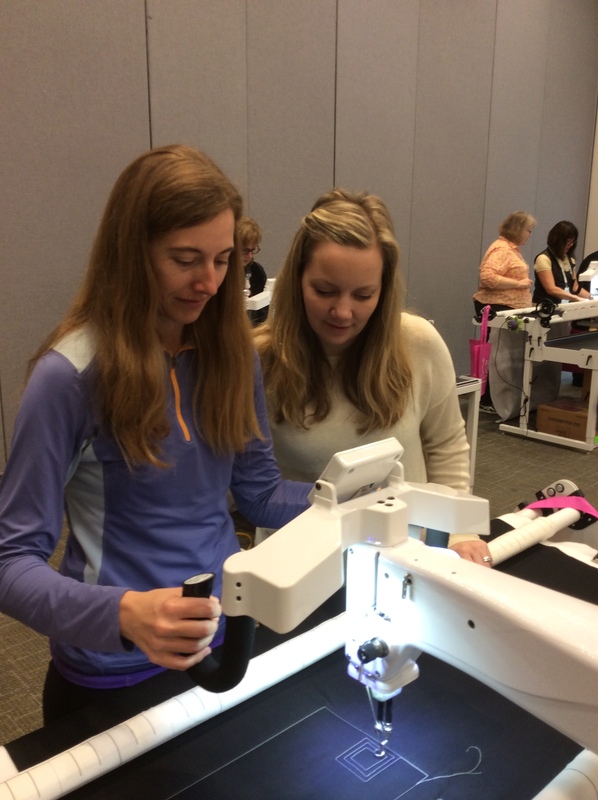 Another aspect of QuiltCon are all the learning and hands-on opportunities available through lectures and workshops. I took lots of notes, and I thought I would pass on what I learned in the lectures and write a review of the workshop I attended. The first lecture that I attended at QuiltCon was a panel discussion moderated by Alissa Haight Carlton on “Publishing Your Work”. On the panel to represent books was Amy Marson from C&T Publishing / Stash books, and to represent the point of view of magazines, the panel included Vivika DeNegre from F+W Media (editor of Modern Patchwork and the QuiltCon magazine). One of the overarching positive attributes of someone submitting their work for consideration is that they follow the submission directions. Book, in particular, are also looking to see if the writer is an expert in the proposal area. To become known for the subject matter, it was suggested to start with magazine publications. Teach. They look to see if you have a social media following. Is your website up to date? Another point that was brought up repeatedly was good, clear photography of your work. They did not think that it was worth your money to pay for professional photography, but they suggested following guidelines like the Photographing Your Quilt post the MQG published for the QuiltCon quilt show submissions. The biggest thing that the publishers and editors are going to look for and be concerned about is if the work you are proposing to have published is original. Alissa’s advice to those of us considering how we can find our voice was not to analyze what else is out there or how we’re different, it’s simply to do what we do, again and again, and eventually our unique voice will emerge. The other lecture I attended was another panel discussion, this time moderated by Jacqueline Sava from Soak. On the panel were Denise Schmidt, Heather Givens, Mary Fons, and Brenda Groelz. I took a lot of notes in the first lecture; I found myself just listening along and enjoying the free form discussion between the panelists in this lecture. The lead in topic or question that Jacqueline posed to the panel was, “What do you define as success for YOU?” She noted that what looks like success for one person might be utter failure for another, and she likes to remind people to consider how much cat food they need to buy. The interplay between the panel was fantastic, and the lecture was much more enjoyable and different than my expectations walking in. I signed up and took an hour long yoga class each morning. The class focused on helping areas that are typically sore / tight on quilters, but the class changed subtly each day. The pace and instruction was clear and geared toward multiple levels of capability. It was a fantastic way to start my day. The only workshop that I registered for was Quilting Negative Space with Angela Walters. Angela is so personable, prepared, and it was a pleasure to be in her class. As I mentioned above, I started each morning with an hour of yoga. I would wake up at 6:30, shower, and have a bit of breakfast (oatmeal and a cup of tea). Running between yoga and to the classroom on Saturday, I realized that I really needed to pee. But I didn’t want to be late for Angela’s class! So I hustled to the room, nabbed a chair, and ran out of the room loudly letting everyone know I needed to pee. *blush* Angela is so sweet though… later in the afternoon, she needed to duck out to the ladies room herself, and she came by to let me know in case anyone was looking for her and “freaked out”. 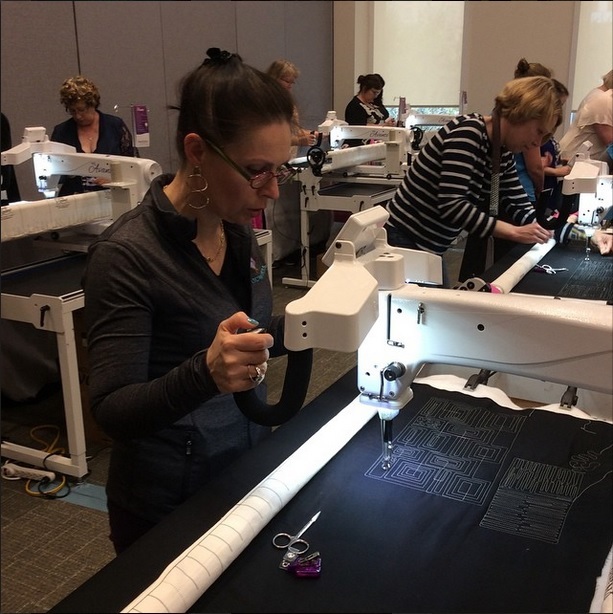 The morning of the Quilting Negative Space workshop focused on familiarizing ourselves with the long arm machines set up in the classroom (Handi Quilter Avante) and an introduction into several different quilting motifs. We partnered up and shared a long arm with another classmate. I partnered with Caroline. After lunch we put it all together and discussed how to combine patterns and ideas together in large areas of negative space. 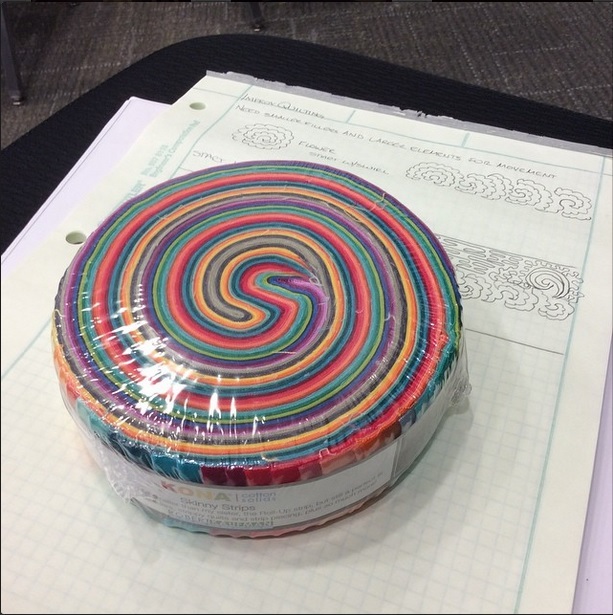 Angela had several drawings for giveaways during the class, and I was super lucky to win a Kona skinny strip roll! Looking forward to the future, I would definitely recommend going to the lectures that speak to you. I liked the balance of only having one all day workshop; I think that having more classes might make it difficult to enjoy the quilt show, visit with other quilters, and have time for the vendor booths. Sounds like you learned a lot! What a great experience. p.s. The notebook in your last photo screams engineer/scientist! Caught my eye! Informative and fun! You can’t beat that. Sounds massively busy with so much to see and do and you definitely got to a lot – your squares look great! thanks for sharing your trip – I’ve really enjoyed the different posts! I wish I could have taken this class with you! That would be so much fun. I really enjoyed Angela’s class, and hope I can take another one from her someday. Next quiltcon I’d really like more half day classes. They all sound great, especially the yoga, what a perfect way to start the day. Do you think the quilting negative space one has changed/improved your ideas on this? They didn’t have any incredibly easy and wonderful ideas did they?! I still have my vintage embroidery quilt to do and I’m very scared of all the solid space, I have to find something very, very easy, preferably quite big and still effective! You picked some good lectures, thank you for the summary of the two you took, I wanted to take those but wound up in a workshop and could not take them. A great recap! Thanks for sharing all of the information that you learned, Yvonne! Ten points for bonding over potty breaks! 🙂 Thanks for the analysis on the events you attended. You attended some great lectures. I was a bit disappointed with mine (for reasons I will likely discuss on my blog, just haven’t had a chance yet). Thanks for taking notes – I especially appreciate Alissa’s comments. Angela is one of my all-time favorite quilters. She’s slated as the keynote speaker for 2017. Lucky you to get to take a class with her and to win some yummy fabric! Thanks for the chuckle. I have heard so much about Angela Walters. I would love to take a class from her.